Saturday, July 13, 6:45 – 8:15 p.m.
NORTHERN VIRGINIA— Summer in Paris, Portrait Paintings by Lilianne Milgrom, opens July 3, 2013 at Crossroads Gallery at Goodwin House Bailey’s Crossroads and closes August 21. Paris-born artist Lilianne Milgrom brings Paris to the Washington area this summer with a stunning new series of eye-catching contemporary portraits. Throughout history, artists have documented their surroundings, their family and friends. While acknowledging the rich legacy of portraiture, artist Lilianne Milgrom’s new portrait series, Summer in Paris, firmly establishes the present moment. Her beautifully executed portraits evoke the kind of understated contemplation that has become rare in contemporary painting. Each painting is an invitation to enter a private world, an intimate scene or a piercing look. We are fleeting observers, tempted to stay and linger, pondering the nature of the sitters and their state of mind. Milgrom’s realistic style never tips over into photographic reproduction. These are paintings in which we feel the presence of the artist’s hand. Summer in Paris allows us to savor life’s quieter moments and reminds us of the pleasure found in beauty and the uniqueness of every member of the human race. Programming for this exhibition includes an artist talk and reception on Saturday, July 13, from 6:45 – 8:15 p.m. at which time accordionist Nancy Leonard will play lively French music and Lilianne Milgrom will speak at 7:15 p.m.
On Thursday, July 18 at 7:00 p.m. Professor Marion Deshmukh, from George Mason University, will give a lecture on the French Impressionism and the 19th Century. Contact Lynda Smith-Bugge at 703-578-7218 or lsmith-bugge [at] goodwinhouse[dot] org for information on this exhibition and accompanying programs. The Big DRAW, an afternoon of free drawing and fun for the community! A festive afternoon of drawing for artists, friends and neighbors. Come draw for an hour, or stay for the afternoon. Washington Studio School, a fine arts organization in Dupont Circle teaching drawing, painting and sculpture to adults and high school teens, welcomes you to its annual BIG DRAW-ing event. This is for artists, the community and is open to the public -- Sunday, June 30, from noon to 4pm. Experience the art of learning to see; draw from costumed models and dynamic set-ups; visit our artist's studios .... There is something for everything with art, artists, music and refreshments all afternoon and all throughout the building. Stop by for one hour or all four! Washington Studio School will have a number of costumed models and some very dynamic still lifes set up throughout the building, and they have paper, charcoal, and erasers available which was generously donated for this event by Utrecht. There will be food and drinks as well. Throughout this exhibit we challenge you to see the differences within the similarities on the canvas. Embrace the tension. Listen. Let them move you. The words below are from the artist’s describing their work. Mixed together, not in any particular order, these words, in the language of the canvas, will speak to you when you feel them. 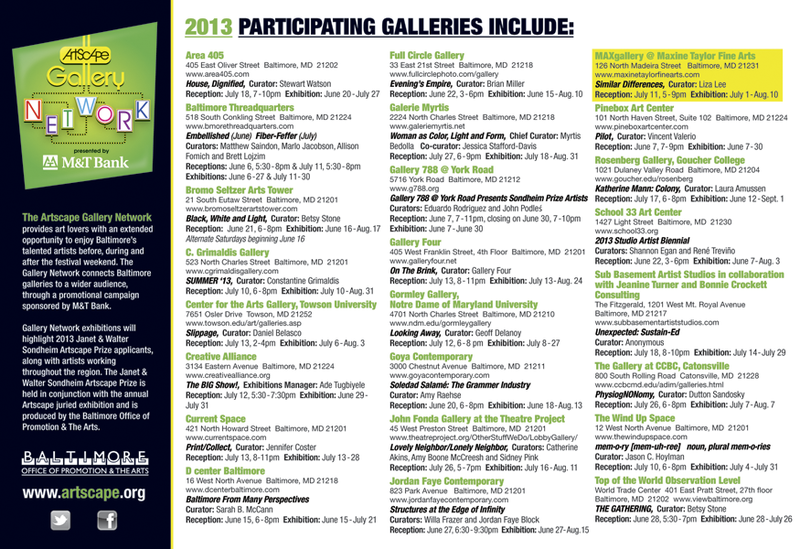 *The Artscape Gallery Network connects two dozen Baltimore galleries to a wider audience through a promotional campaign sponsored by M&T Bank and provides art lovers with an extended opportunity to enjoy Baltimore’s talented artists before, during and after the festival weekend. 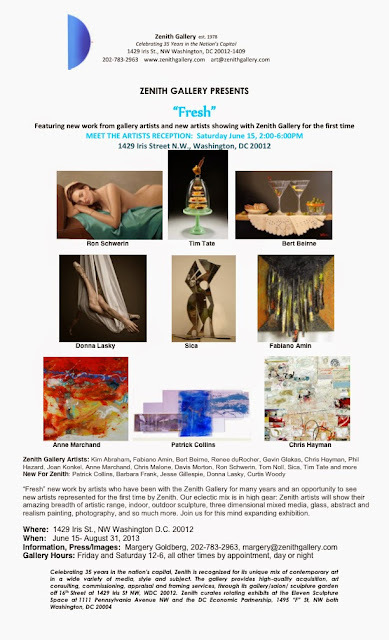 The Artscape Gallery Network exhibitions highlight 2013 Janet & Walter Sondheim Artscape Prize applicants, along with artists working throughout the region. *Five participating venues have been identified as Showcase Galleries of the Artscape Gallery Network. Selected galleries receive enhanced marketing opportunities and exhibition receptions. Artscape on July 19 - Sunday, July 21, 2013 is America's largest free arts festival, attracting 350,000+ attendees over three days. Artscape features 150+ fine artists, fashion designers and craftspeople; visual art exhibits on and off-site, including exhibitions, outdoor sculpture, art cars, photography and the Janet & Walter Sondheim Prize; incredible live concerts on outdoor stages; a full schedule of performing arts including dance, opera, theater, film, experimental music and the Baltimore Symphony Orchestra; family events such as hands-on projects, demonstrations, competitions, children's entertainers and street theater; and a delicious, international menu of food and beverages that is available throughout the festival site. FREE and open to the public! Artscape is held outdoors in tents, and inside the neighborhood's premier exhibition spaces and performing arts venues. The event is handicapped accessible. Do You Feel What I See? Going against proper gallery etiquette, Calvin Coleman invites you to touch the textured surfaces of his paintings. During the Artist’s Talk, Calvin will discuss his unique process and experience as a seeing artist who has created a series of paintings for the blind and visually impaired. The artist’s statement, titles and wall text describing the paintings are written in Braille and hang throughout the gallery space. 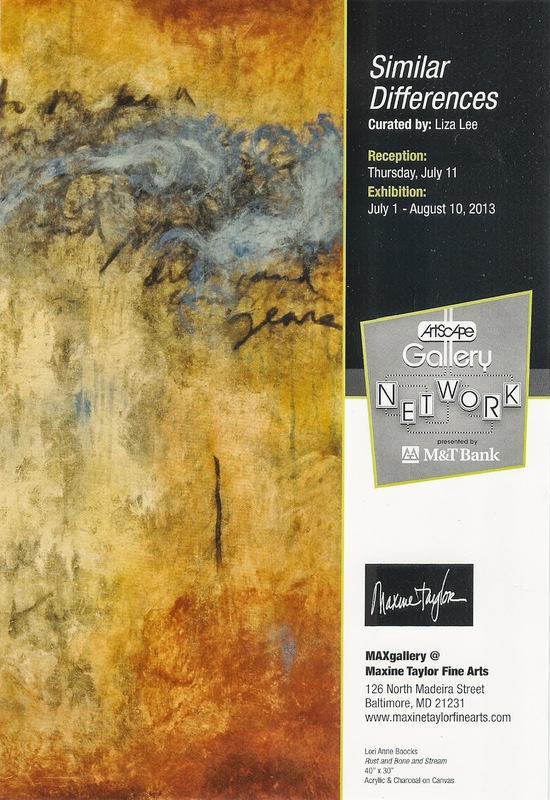 The exhibition runs through Sunday, June 30, 2013. In a world where touch is forbidden, artist Calvin Coleman’s exhibition “Do You Feel What I See?”invites the blind and visually impaired to experience his paintings with their hands. For the seeing, they too may engage with his work in a way that is considered taboo and against proper gallery etiquette, by closing their eyes and running their fingers across the painterly surfaces. FREE and open to public. Seating is limited! This summer, the Corcoran Gallery of Art and College of Art + Design, in conjunction with the landmark photographic exhibition WAR/PHOTOGRAPHY: Images of Armed Conflict and Its Aftermath, presents a series of programs that enable visitors to engage with the exhibition on a personal level. Programs, including Art Response Family Workshops; Gallery Talks; and a Visual Dialogue on Conflict from photographer Louie Palu, are designed to enrich and expand on many themes and stories about life during wartime, and encourage the personal reflection befitting of the show's emotional nature. Additionally, on July 6, the Corcoran will mark the public opening of WAR/PHOTOGRAPHY with a FREE day of programs and workshops themed to the exhibition. Attendees will have the opportunity to participate in a number of events, including a workshop conducted by the Veterans Oral History Project of the Library of Congress, a film screening, and a children's workshop booth sponsored by Tragedy Assistance Programs for Survivors. A military band will be on hand to add to the spirit of the festivities. Admission is FREE and open to the public. Exhibitions open Saturday, June 15, with a reception from 6 to 9 p.m. and close Sunday, August 11. 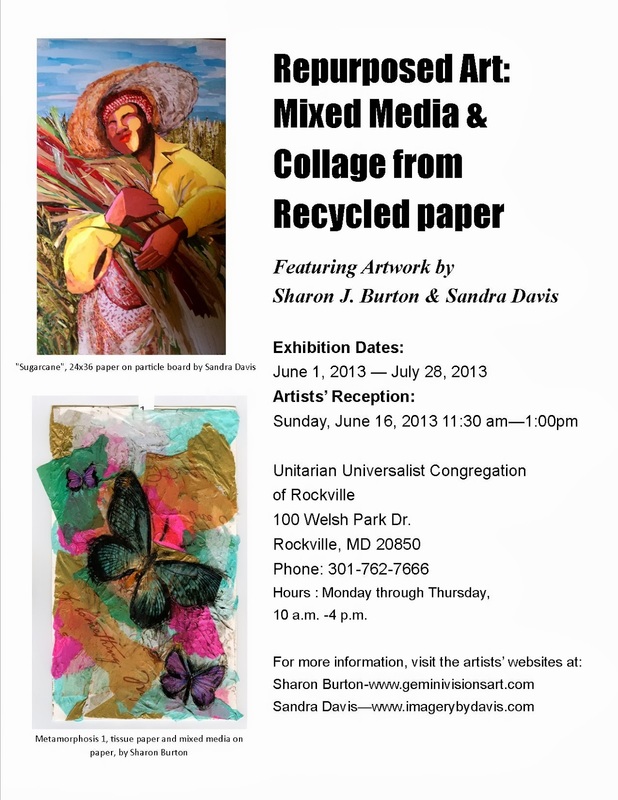 "Repurposed Art: Mixed Media and Collage from Recycled Materials" showcases Sharon J. Burton & Sandra Davis with paper...whether from magazines, newspapers or tissue paper. The show opens June 1st and will be on view through July 28th. 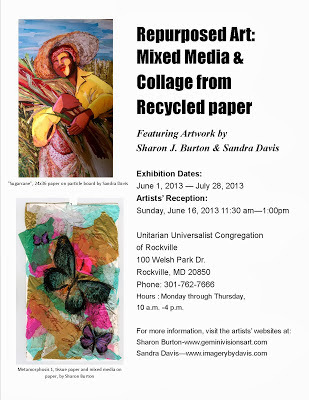 There is a reception scheduled for Sunday, June 16, 2013 beginning at 11:30 am at the church.